Water Direct has created an innovative initiative called WaterTight™ to help non-household water consumers build resilience and mitigate the potential costs of a water supply interruption. Nearly two years after the opening of the water retail market for non-household customers, the concept of contingency planning for water, and the risks and potential consequences of not planning for a water supply loss, are still not widely understood. Water Direct has recently released a short, animated video to help illustrate the fact that many organisations overlook water as a business continuity theme. As winners of the 2018 CIR award for Disaster Recover as a Service, Water Direct is gaining traction and recognition across the industry for its efforts. We often take continuity of water supply for granted in the UK, in fact research suggests that two thirds of businesses have no plan in place to deal with water quality or supply issues. The company’s research has also found that most business continuity consultants wouldn’t routinely raise water as a potential issue with their clients. Water Direct is actively engaged with other stakeholders in the water supply market including consumers, water retailers, special interest groups, industry bodies and consultants. Through this program of education, non-household customers (including self-supply licensees) and the market at large, are starting to develop a stronger understanding of the need for thorough planning and where the responsibilities lie. The objective is to create open and transparent discussion around the subject of water as a critical business continuity theme with equal importance to IT and power. The company is hopeful that this will help expand the generally accepted scope of disaster recovery services, raise the profile of contingency planning for water alongside power and IT and stimulate increased conversation around the subject. Through its innovative approach to collaboration Water Direct is helping to proactively address the needs of the non-household market through a unique added-value partnership model. For example, their bespoke partnerships with water retailers enables the provision of alternative water supplies to non-household customers through a mechanism designed to suit each retailer. 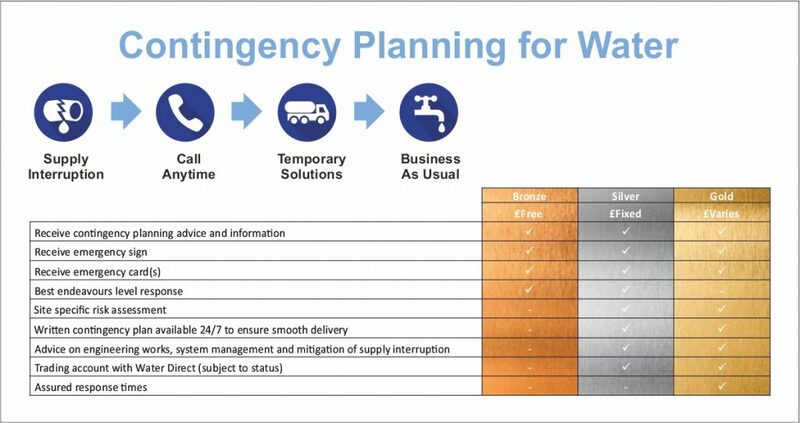 The contingency planning service is particularly popular with business customers who are responsible for creating and maintaining their own contingency plans for water. In a market where customers are increasingly making decisions on value over price, Water Direct is helping to add that value alongside improved customer service, reduced costs, improved billing, smart metering services, consumption reduction and leak detection. This allows retailers to attract new and retain existing customers. It seems the question “Who is responsible to plan for supply interruptions?” is often misunderstood. While wholesalers clearly have responsibility for maintenance of their own networks, and consumers will be responsible for maintenance of assets on their own property; the question is not about who will make a repair, but who will provide an alternative supply in the meantime, in what shape, on what scale and by when? There is clearly a high-level understanding in principal that contingency planning for water is important, however so far this has proved slow to filter clearly to consumers. Water Direct is working hard to help manage the expectations of non-household customers, and openly address the grey area that exists around responsibility for alternative/emergency supplies. Training sessions and presentations to retailer key account managers and customers alike. Engagement with the facilities management sector to develop a best practice guide and deliver training to Facilities Managers, Emergency Planners and business continuity teams. Speaking at conferences and events to raise awareness of the subject of water supply contingency planning. Water Direct has experienced first-hand a lack of awareness of the risk that an organisation like an NHS trust, food producer or national hospitality chain could be without water. 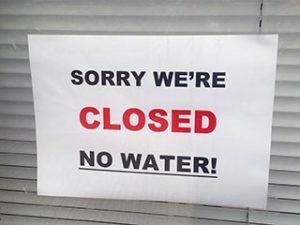 All businesses rely on water to some degree and an interruption to the water supply could be disastrous, making contingency planning essential. This means that the key element to the initiative is the contingency plan itself, offered in Gold, Silver and Bronze levels to suit the needs of the customer. Bearing in mind that the same organisations routinely invest in emergency power generators, IT back up and support; Water Direct suggests that the water supply should be treated as equal priority.